This year’s WonderCon Anaheim Program Book cover celebrates an amazing comics milestone: the 1000th issue of Action Comics, featuring Superman! Eighty years ago, two young men from Cleveland, Ohio—Jerry Siegel and Joe Shuster—saw their dreams come true when their creation, Superman, was picked to be the cover feature on a new comic from National Allied Publications, known today as DC Comics. Action Comics #1 debuted in June of 1938 with a cover featuring a costumed man lifting a car and smashing it with his bare hands. The book was a massive hit and 999 issues later, Superman is one of the most recognizable fictional characters in the world, the star of comics, movies, television, animated films, and much more. Pencils by Dan Jurgens, inks by Norm Rapmund, colors by Alex Sinclair, lettering by Todd Klein. The cover is illustrated by WonderCon Anaheim 2018 special guest Dan Jurgens, who has a long history with Superman. Jurgens was one of the creators behind the “Death of Superman” storyline in the 1990s and has helped to redefine the character in the Rebirth era. Joining Dan are his long-time inker Norm Rapmund, plus color artist Alex Sinclair, and letterer Todd Klein, celebrating the Man of Steel on his groundbreaking anniversary, and the character’s continued quest for truth, justice, and the American way! The WonderCon Anaheim Program Book is given free to all attendees at the event. 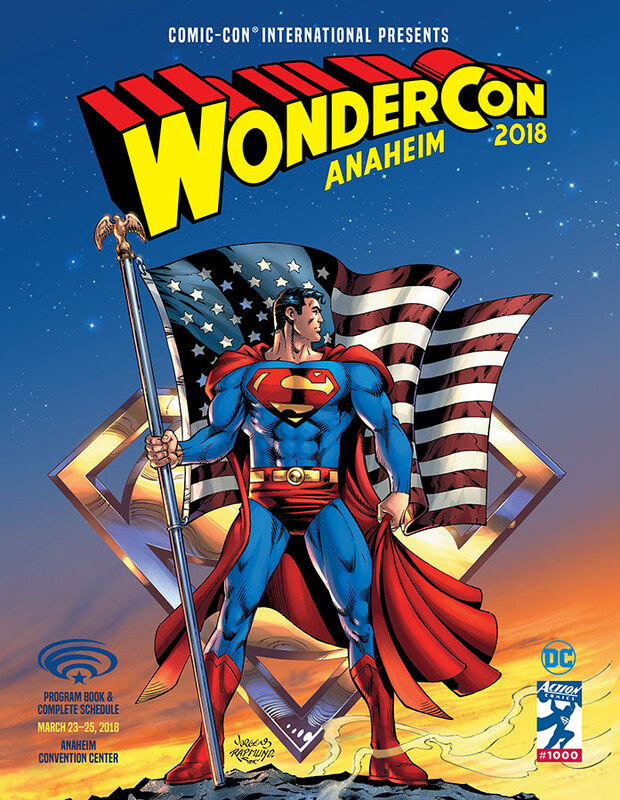 It’s the official guide to all things WonderCon, including the complete schedules for programs, anime, and games, bios and photos of our special guests, maps of the Anaheim Convention Center and the area around it, and much more. Make sure to pick up your copy when you arrive at WonderCon. Dan, Norm, and Alex will all be in Artists’ Alley, so get that cover signed by the artists! Happy 80th birthday, Superman, and happy 1000th issue of Action Comics!